The magnificent red sandstone Powis Castle stands high on a promontory near Welshpool and would have presented an imposing spectacle to those who risked to storm it. 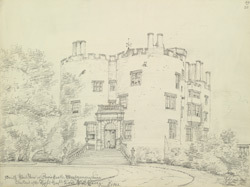 During medieval times the castle was a military stronghold for the princes of Powys in their battles against the English and the princes of Gwynedd. The castle became home to the Herbert family in the 16th century and later to the Clive family or the Earls of Powis. It was during the 17th and 18th centuries that the grounds were redesigned and the gardens, particularly the terraces, became known throughout Europe.